WASHINGTON — Just add cash. That was the ingredient Republican and Democratic leaders on Capitol Hill needed to strike and pass a long-term budget deal after months of bitter fighting across and within party lines about how to spend funds that had been limited by budget caps. An $89 billion injection "changes a lot of votes," explained North Carolina Rep. Mark Meadows, the chairman of Republicans' arch-conservative Freedom Caucus and an opponent of the bill, hours before it passed. And that figure, an important factor in securing the support of lawmakers from the Republican-heavy states of Texas and Florida, only accounted for the disaster-recovery portion of an agreement that clears the way for Congress to commit to an additional $400 billion-plus in deficit spending over the next decade. The deal, which provides a bookend to the $1.5 trillion tax cut President Trump signed into law, signals the end of an era of relative fiscal restraint in Washington and a return to the days when any intractable policy problem could be solved by giving both sides more money. In part, that means $165 billion more for the Pentagon over the next two years, a priority for President Donald Trump and defense hawks in both parties in Congress who argued that the uncertainty of month-to-month stopgap spending bills and a tight "sequestration" cap on defense spending were hurting a military that's been at war since 2001. The opening to get rid of the cap and boost defense spending was a powerful force in favor of cutting a deal with Democrats, said Sen. Lindsey Graham. "From the Republican side, it's just the damage done to the military by sequestration is just getting too big to ignore," he said. "The worst thing for an incumbent is that you create a storyline that you're undercutting the military in a time of war. Everybody's politically exposed on that issue." But it was also too much to bear for some conservatives — including Sen. Rand Paul, R-Ky., who singlehandedly pushed the voting process past the original midnight deadline and into the pre-dawn hours. On the Senate floor, Paul took aim at his colleagues. "I can't, in all good honesty, in all good faith, just look the other way because my party is now complicit in the deficits. But really who's to blame? Both parties," said the Kentucky senator, whose actions forced a brief government shutdown Friday — the second this year. "We have a 700-page bill that no one has read that was printed at midnight. No one will read this bill, nothing will be reformed, the waste will continue and government will keep taking your money irresponsibly and adding to a $20 trillion debt." He slowed the bill's progress, preventing its passage before the midnight deadline that signaled an official lapse in funding. But he couldn't stop it. "Republicans are being offered a false choice today: either support the military or maintain fiscal discipline," Rep. Mark Walker, R-N.C., the chairman of the conservative Republican Study Committee said Thursday. "I am disappointed this deal creates friction among Republicans who believe in both." Democrats hardly walked away empty-handed. While they lost out on an Obama-era mandate to treat defense and domestic spending equally, the agreement calls for an increase of $131 billion on the domestic side of the ledger. It also funds opioid abatement and community health centers, priorities that had bipartisan support. That lucre proved too enticing to turn down, even for some Democrats who campaign as fiscal hawks. "No one can say what we're doing is responsible," Sen. Joe Manchin, D-W.Va., said before voting for the bill. But, he explained, "I've got opium money coming, and I've got to make sure I defend my state." 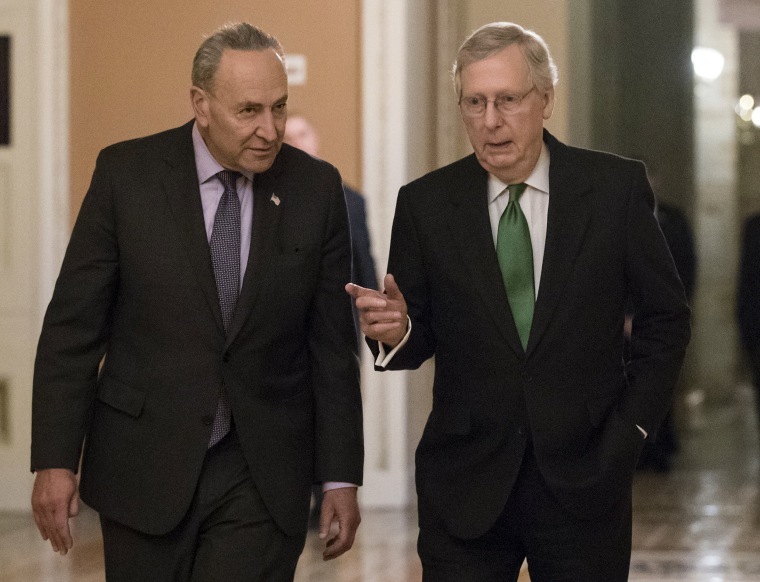 The framework for deal-making was set when Democrats ended a government shutdown three weeks ago and sat down at the negotiating table with Senate Majority Leader Mitch McConnell, R-Ky. The details were hammered out by aides to McConnell, Senate Minority Leader Chuck Schumer, D-N.Y., House Speaker Paul Ryan, R-Wis., and House Minority Leader Nancy Pelosi, D-Calif. In consultation with the White House, the party leaders in Congress managed to craft a package that could pass both chambers. But it came with a serious dose of heartburn for lawmakers on both sides of the political spectrum. Republican spending hawks fumed about their own party's taste for spending borrowed money. "This is a terrible bill substantively and symbolically," Rep. Mo Brooks, R-Ala., said on MSNBC Thursday. "Substantively, it rushes us back in the direction of an insolvency and bankruptcy on a string of trillion-dollar-a-year deficits that may go down as far as the eye can see until we go insolvent. Symbolically, it is telling the world and the American people that not only can you count on Democrats to spend money that we don't have ... but, by golly, you've got Republicans who want to outbid them." Some economists say recent fiscal policy, including the budget deal, could lead to higher interest rates in the short term and slower economic growth over the long run. "Washington has gone back to the future with a 1980s fiscal policy of big tax cuts for the rich, big military spending and big deficits," said Aaron Klein, a former Obama administration Treasury Department official who is a fellow in economic studies at the Brookings Institution. "The key question is not will this overheat the economy, but whether the Fed believes it will. If the Fed thinks Congress is fiscally reckless, it could offset much of this with higher interest rates." Many Democrats were embittered by the exclusion of a solution for "Dreamers," a group of 1.8 million undocumented immigrants who were brought to the country illegally as children. The concerns on the left were so strong that Pelosi, House Minority Whip Steny Hoyer, D-Md., and House Democratic Caucus Chairman Joe Crowley, D-N.Y., announced that they would vote against the bill but not whip votes to stop its passage. As the finishing touches were being put on the agreement Wednesday, Pelosi started what would become a record-breaking, eight-hour marathon speech in defense of Dreamers, a sign of both her commitment to the issue and her need to shore up her constituency in the face of having negotiated a deal that didn't address it. House Speaker Paul Ryan, R-Wis., said Thursday that the House would consider immigration legislation if it is supported by Trump, but Democrats don't like the White House's proposal because it would limit the ability of immigrants to bring family members to the country and curtail the nation's diversity lottery. But with mid-term elections approaching, party leaders recognized the political danger to sitting lawmakers — most immediately Senate Democrats and House Republicans — of failing to write a budget and either shutting down the government or funding its operations in short bursts. "Dysfunction is bad for incumbents," Graham said. Trump's support gave cover to rank-and-file Republicans to vote for the deal, and many Democrats prioritized the functioning of government over a scenario in which they shut it down in the name of trying to protect Dreamers — a strategy they tried with no luck in the Senate last month. Those factors put the deal on the goal line. But it slid into the end zone on cold, hard cash.